On our drive up to Maine, Kish wanted to grab a cup of coffee, so we stopped at your basic 7-Eleven in a small town in western Massachusetts. It’s the first time I’ve been in a 7-Eleven in years. It’s safe to say that the current 7-Eleven coffee station, even in your basic 7-Eleven in small town America, is . . . elaborate. In fact, incredibly elaborate would not be an exaggeration. Whereas there used to be one little area with a few coffee pots where you could pour yourself a generic regular coffee or decaf coffee and add your standard creamer, sugar, or non-sugar sweetener, now there is a long row of different coffee options, depending on your preference in strength and flavoring, and then an extensive choice of creamers and additives that apparently is offered to allow you get your 7-Eleven cup of coffee as close to what a high-end coffee house barista might serve you. My mind reeled at some of the flavoring options. There’s hazelnut, of course, but cinnamon? Marshmallow? There had to be more than a dozen different creamer flavors, and that doesn’t even account for the dry materials you could add to your cup. The standard creamer bin was totally outnumbered by a host of sweetening alternatives. Coffee is increasingly becoming less like coffee, and more like candy or ice cream or dessert. Americans apparently have such a sweet tooth that even the old cup of joe from a 7-Eleven store needs to be gussied up into some frothy, hyper-sweet concoction. Is it any wonder that we’ve got an obesity problem in this country? I was sitting in my seat on my flight to Denver, doing some reading for work and minding my own business, when suddenly my seat lurched backward. I momentarily wondered what had happened,, then I realized the truth: the person who was sitting in the seat behind me was getting up and had to grab the back of my seat with both hands to help themselves up — and from the amount of the backward movement of my seat, I figured it was a big person. When I looked behind me, sure enough I saw a heavyset guy struggling to rise from his seat and head off to the bathroom. How often has this happened to you? For me, it’s become commonplace. We’ve got such an obesity problem in this country that people can’t get up from their seats without help. Even the armrests that allow you to balance yourself as you rise from your seat on the airplane aren’t sufficient, so the obese travelers have to hang on to the back to the seat in front of them and pull themselves to their feet. Never mind that there’s somebody sitting in that seat they’re grabbing, and that the seat grab is going to cause that unlucky person to move backward unexpectedly, interrupting whatever they might be doing. There’s never an apology, either. It’s as if the seat you are sitting in was intended solely to help tubby passengers stand up, giving them every right to wrestle with your seat and maneuver it as they see fit so they can get on their feet. It’s a minor annoyance, to be sure, but it’s just another little reminder of how extensive the obesity epidemic is in this country. 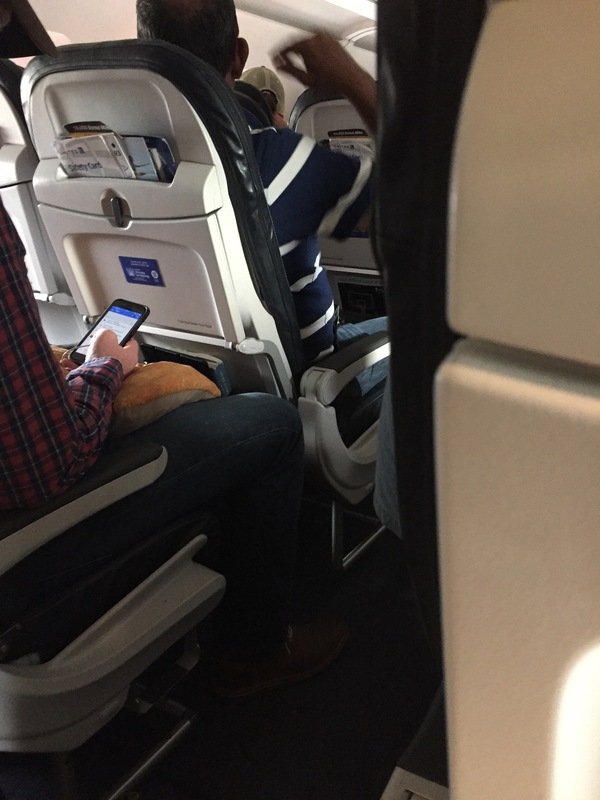 When people can’t even get to their feet on a plane without putting both hands on the seat in front of them and pulling with all of their might, it’s obviously a problem. On Saturday and Sunday, Kish and I drove home from Maine. It was a long trip, so we broke it up into two days. The distance wasn’t a problem for me, though, because I just enjoy driving, listening to the radio, and seeing the countryside pass by. My God! We are a country of porkers! Look, I recognize that the crowd you see on the interstate highway system in the Eastern time zone isn’t a random statistical sample of the United States as a whole. I know you can’t extrapolate from the people I happened to see, by chance, as I stopped to fill up or hit the men’s restroom. But after a while the number of seriously obese people I was seeing at every stop became so obvious that it just couldn’t be ignored. And I’m not talking about people who are a few pounds above their ideal, either. I’m talking about people that move with the slow waddle characteristic of the grossly overweight, men with colossal beer guts, women who are huffing and puffing just walking from their cars to a roadside restroom, and people who look like they are ready to burst out of their clothes. I’m not saying this to be funny, or provocative. It really was disturbing, and depressing. There obviously are a lot of morbidly obese people in this country, and if you want to see them just drive a while on the interstate highway system. When you think about the back problems, and diabetes, and joint problems, and heart disease, and high blood pressure, and other health conditions associated with obesity, you realize that the weight problems of so many people have to be a large contributor to the exploding health care costs in the United States. Is it any wonder that we can’t control health care costs, when so many people can’t control their own urges and their own weight?